Air Products is a Fortune 500 Company with over 20,000 employees and operations in more than 50 countries, serving customers across a wide range of industries from food and beverage, health and personal care to energy, transportation and semiconductors. Air Products supplies a unique portfolio of atmospheric gases, process and specialty gases, performance materials, equipment and services. 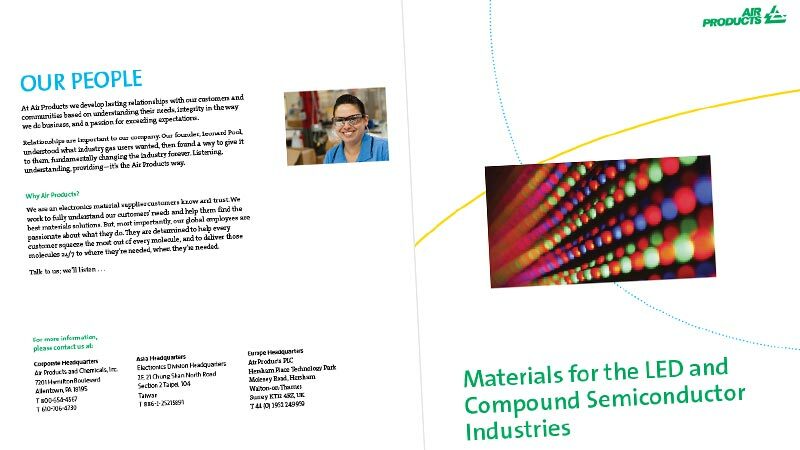 SHIRKWORX was given the assignment to create a 6-page brochure highlighting AirProducts’ product offerings for the LED Compound and Semiconductor industries.